A leaked study by the US army says abuse of prisoners in US custody is more widespread than previously known, a US newspaper has reported. Cases of maltreatment date from as early as the war in Afghanistan in 2002 to as recently as last month in Iraq, according to The New York Times. The report says three dozen cases are being investigated, including several deaths during interrogations. 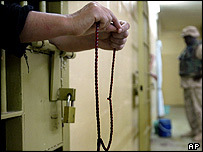 It comes as investigations into abuse at Abu Ghraib jail in Iraq continue. The report was ordered by the army in the wake of the Abu Ghraib scandal, in which US guards were photographed and videoed abusing prisoners. It says that in many cases among 37 prisoners who died in US custody in Iraq and Afghanistan, the army did not conduct autopsies and the causes of death remain undetermined. In one of the oldest cases, the report says military intelligence officials and military police were "involved at various times in assaulting and mistreating" a prisoner who died in Afghanistan in December 2002. In another case, a prisoner in the custody of US navy commandos died from "blunt force trauma to the torso and positional asphyxia" in Iraq in April 2003, the report says. It also says army interrogators in Samarra, north of Baghdad, "struck and pulled the hair of detainees" and "forced into asphyxiation numerous detainees in an attempt to obtain information" over a period of 10 weeks last spring. The report also documents an alleged case of sexual assault of a female prisoner at Abu Ghraib last year. It says two soldiers allegedly kissed the prisoner and held her hand, while a third soldier acted as look-out. So far, one American soldier has been convicted of abuse at Abu Ghraib and another six are facing criminal charges. "Many Iraqis will demand to be in charge of military operations"